When Mike Zani moved to the banks of the Sakonnet River in Rhode Island, he wanted a beautiful yacht for his mooring but was not willing to pay $50,000 for one of the fine-lined modern/classic daysailers on the market today, writes Chris Museler. A cool $4,500 bought him a 1962 Cape Cod Marlin, a GRP derivative of L Francis Herreshoff’s Fish Class design, but with a blister cabin house and a strip of opaque GRP in place of portholes (ugh!). Now that it’s MAY, pencil this great event into your calendar if you love wooden boats as we do…. The Herreshoff Marine Museum invites you to its 7th biannual Classic Yacht Symposium from May 20th to 22nd. Attracting owners, designers, builders and enthusiasts, the day of talks and two additional days of related events is a highlight in the Museum calendar with a special collaborative atmosphere amongst participants. Included are ten talks by experts in a range of classic yacht activities from sailing to restoration to building some of the great designs representative of the maritime heritage which is celebrated today. This year also features a special panel discussion about what constitutes the breadth and boundaries of Classic Yachts. This will be undertaken with a panel of highly recognized experts and opinion leaders in the field and held at the Museum on the Friday evening. Visits to active projects at boatyards will take place on Friday. Sunday activities will include tours of the Museum Exhibits and visits to several key yachts and boats on display. Roger Williams University will be the site of Saturday’s full day of talks and discussions. This coming Saturday the 6th is the fourth annual Frostbite Bash! Join the party and enjoy full open bars and food tastings from a variety of top local restaurants and vendors. Dance the night away in the historic Hall of Boats (A must see! ), bid on items in the live and silent auctions, and snap photos with your friends in our photo booth. A night you’re sure not to forget! Herreshoff Marine Museum uses this party as a major fundraiser for their great year-round programs. From adult and junior sailing and seamanship programs in their fleet of 12 1/2’s, to a lively winter lecture series and many fun and educational events at the museum – there is something for everyone. The Herreshoff Marine Museum / America’s Cup Hall of Fame is dedicated to the education and inspiration of the public through presentations of the history and innovative work of the Herreshoff Manufacturing Company and the America’s Cup competition. The Museum, bordering beautiful Narragansett Bay, in Bristol, Rhode Island, is one of the nation’s most important historic maritime treasures. We regularly host classic yacht regattas, sponsor symposia on classic yacht design and restoration, and operate an outstanding sailing school for youth and adults. We celebrate excellence in design, innovation, education, and technology. Immerse yourself in exhibits about the Herreshoff Manufacturing Company, the America’s Cup, and the fabulous people and yachts that gained fame around the world. Participate in our extraordinary events and expand your horizons. Visit, join, and be a part of a great tradition. The Bash will also be your first opportunity to witness the unveiling of the RELIANCE Model, a 30 foot, museum quality model of the America’s Cup winner, RELIANCE. Need a place to stay the night of the Bash? Be sure to check out The Inn at Mount Hope Farm. They are offering a special rate called “From Bash to Bed” for $99 with continental breakfast. This deal will run out fast so get it while you can. Call to make your reservation now at 401-254-1745. Mt Hope Farm, if you have never been, is a pristine, wonderful location on Mt Hope Bay in Bristol. Purchase Tickets to the Bash! For a limited time, if you purchase 5 tickets you will get the 6th for free! Well, if this isn’t one of the most clever ideas you’ve never thought of – then please tell us what is! People invent plenty of crazy ways to steam bend wood when building or restoring wooden boats, but few have used or even considered using a plastic bag. Also extremely clever is how Lou demonstrates his method for progressive bevel cutting. Check it out! If Louis Sauzedde isn’t the ultimate wooden shipwright and movie star, then who could it be? He has turned wooden boat restoration into a video series attracting lots of attention and fixing up some special boats along the way. We love that he attacks his projects with confidence and traditional sense, but is not afraid to try out a new material or new idea that challenges everything he was taught about his profession. Follow along with the rest of this 4 part (so far) video series on the restoration of “Remora” here and delight in watching Lou work and in his super wicked Rhody accent. So killa! 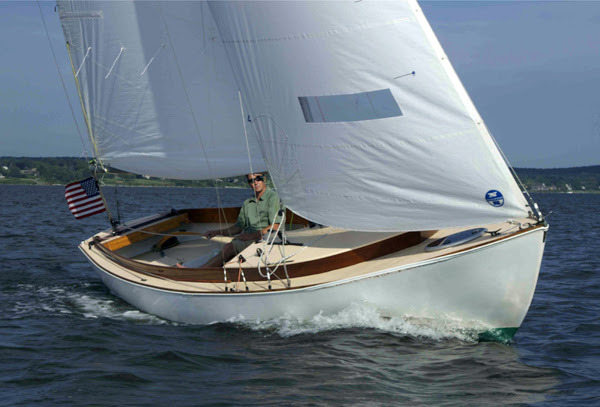 Sorry if you can’t appreciate the draw of our neighbor, Herreshoff’s, amazing yacht design. We can’t get enough of looking at Capt. Nat’s amazing long overhangs, beautiful sail plans and wonderful wooden spars and decks. And then there is the performance of most of his designs… none of his designs are slow and cumbersome. Instead they slice through the water gracefully, and have historically mastered the yacht racing course and beyond. So pardon the overdose of Herreshoff videos and content, but he continues to impress sailors and yachtspeople around the world. And this video is a testament to his amazing yacht design. Go for a sail on Marilee, a New York 40, and feel how awesome it is to be a part of yachting history. Upon my return from sailing around the world, the first thing I did was to take out my family’s Herreshoff 12½. My cruising yacht is evidently better for ocean crossings, but there’s something about the 12½ that hooks you, no matter how many sea miles you have travelled, no matter how many boats you have handled. In a sunny but cool ’smoky sou’wester’ on Eggemoggin Reach in Downeast Maine, the 12½ flew along, water gurgling under her forefoot and a bubbly wake streaming behind her. With only a finger or two on the delicate tiller, I could feel her respond to every puff and lull. Moving only my arm I could tack, and gybing was almost as effortless, hauling in and letting out the mainsheet the only added task. As she glided back to the harbor in a dying zephyr, I thought how wonderful it was that she’s been doing this for almost 80 years. Captain Nat Herreshoff probably never imagined someone (like his grandson, Halsey Herreshoff) would be taking the measurements off of his molds to make 3D computer images of the boats lines. For certain he envisioned them being used to create boats to the millimeter of his scaled models, but the computer 3D imaging – never! Don’t misunderstand though, Capt. Nat was at the forefront of yachting’s technological movement at his time, developing the first light steam engine and creating the first fast steam torpedo boats for the US Navy.